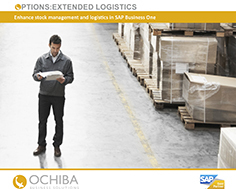 Ochiba OPTIONS Extended Logistics for SAP Business One can help if your company struggles with unexpected delays and can’t meet demand. The modules incorporates a number of features to streamline your day-to-day stock management processes, and will provide increased visibility and management of long lead time items. Accessed from the Business Partner record, the enhanced Business Partner Overview Screen provides visibility of both the customer account status as well as open transactions. This will allow you to review sales patterns for up to five years, which is perfect for credit control and sales analysis. All the information you need is available in a single screen so you can say goodbye to navigating between multiple tabs. Accessed from the Item master record, the Item Master Usage Screen provides you with visibility of item movements. This allows you to monitor both ‘period to date’ and ‘year to date’ sales and purchases. You will also be able to see rolling monthly usage and up to date pricing, including customer specific pricing, within the same screen. The Container Management screen allows you to build and track a container load based on purchase order lines from multiple suppliers. The container can then be managed centrally, tracking due dates and consignment references. The purchase order line delivery dates are automatically updated as the container due date changes, providing Procurement with the very latest information by which to act. The Container can be ‘Receipted onto Water’, with visibility retained in SAP Business One. Once the Container arrives at Goods In, the Container Management Receipting Screen allows you to easily confirm and receive the contents of the container, generating the appropriate Goods Receipt transactions to ensure that the stock levels are updated instantly in SAP Business One.